Since we’ve been thinking about the upcoming November election, we are reminded of the article that we wrote about in our last eNews, regarding the complaint filed with Berkeley’s Fair Campaign Practices Commission (FCPC) over a violation by the Berkeley Rental Housing Coalition Independent Expenditure Committee. This committee, sponsored by the Berkeley Property Owners Association, violated Berkeley election laws by sending out a mailer in support of Judy Hunt and Nate Wollman for Rent Board Commissioner six days before the election and not reporting that action as required by both State and local law. The details are not going to be re-hashed here – you can read about them in Issue 23 – but the FCPC set the fine for this violation at $18,900.84. As of May 2018, about a year and a half after the violation, they were waiting for a hearing date to be set. So, what happened? As near as we can tell, the answer is NOTHING even though the Chair of the FCPC has been continually asking that a hearing date be set. We looked at minutes posted on their website that are posted through July 2018. Nothing there. Since minutes for August are not yet posted, we also looked at their August 16 agenda and this issue was not listed. We’ll keep trying to find out and let you know, but don’t hold your breath on this one. 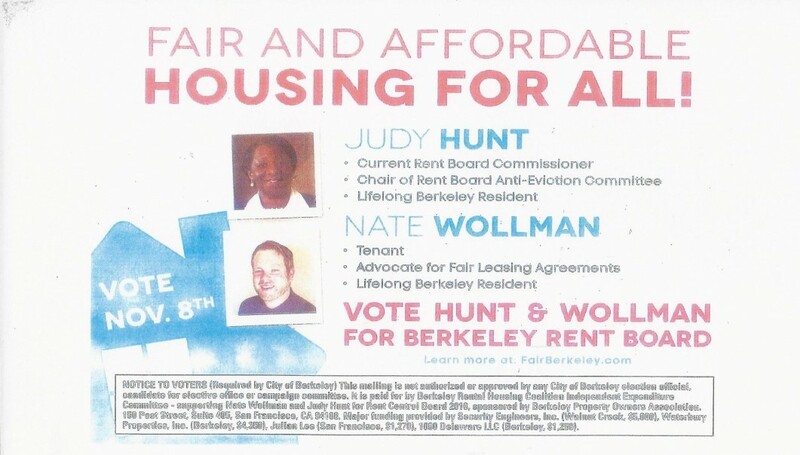 By the way, Judy Hunt who was supported by this flyer, and who lost the election in November 2018, is running again for Rent Control Commissioner in November 2018. We didn’t see Nate Wollman on the list of current candidates. To be fair, we must say that the Committee that printed and distributed this flyer is not controlled by the candidates that appear on the flyer. Once again there is controversy about land use at the Clark Kerr Campus. Back in the day, (1949), the California Schools for the Deaf and Blind were built there. In the 1970s they decided to move to a safer location in the city of Fremont because the Berkeley site is in the Alquist Priolo Earthquake Fault Zone. (They moved, but ironically, they found out later that their new site was also impacted by the same Hayward Fault – but that’s another story for another time.) The property was added to the National Registry of Historic Places in 1982. UC Berkeley scooped up the property in 1986 with plans to put student housing on what they were now calling the Clark Kerr Campus, now re-named in honor of Cal’s first Chancellor. It was a huge and highly controversial issue in the City even though the Campus could essentially do whatever they wanted to do. The Campus in a cooperative mode, and wanting to move forward with their plans, signed agreements (covenants) with surrounding neighbors and a memorandum of understanding with the city of Berkeley. These agreements provided how the Clark Kerr Campus property would be used, what is allowed and what is restricted. They are still in effect and will end in the year 2032. UC Berkeley is now proposing to construct four intercollegiate beach volleyball facilities on the Clark Kerr Campus with a target date of January 2019. Beside the volleyball courts themselves, there would be a 3,000 square foot club house, permanent seating for 400 spectators, a scoreboard, amplified sound, and a bank of lights 50 to 70 feet tall. The proposed volleyball court plan makes no provision for parking on site, nor does it consider the impacts of noise and light on surrounding residential neighbors. Neighbors around the Clark Kerr Campus have long endured the impacts from the very heavy daily traffic generated by the Berkeley campus, including Memorial Stadium. The Claremont Elmwood Neighborhood Association (CENA), Dwight-Hillside Neighborhood Association and the Panoramic Hill Neighborhood Association studied the proposed volleyball plan and concluded that all things considered, a more appropriate site for such a facility would be at the Edwards Stadium location which already has lights, some nearby parking and is close to public transportation. The Clark Kerr Campus now houses students, the Krutch Theater, a conference center and child development centers. While there have been repeated breaches of the covenants, the neighborhoods have tried to work with the University throughout the years, sometimes successfully, sometimes not. There is no certainty there will be any agreement at all in this instance. Around 800 neighbors hold these covenant agreements which will allow the University to proceed with the project if 51% of them agree. When, one block from the UC Berkeley Campus, the construction barriers went up on University between Shattuck and Walnut in front of what we have known as the Acheson Commons, we learned its new name, the Modera Acheson. This new project is really four buildings that stretch from the old one-story MacFarlane candy store, continues east on University toward the UC Campus, incorporating the existing Bachenheimer Building and demolishing the former Krishna Copy, Crepes a-Go-Go, and Ace Hardware buildings, then rounds the corner where two old brown shingle houses were once located. The facades of these old buildings will be retained. The new buildings will be six-stories tall, and stand at an approved height, not to exceed 75 feet. Mill Creek states that all their Modera brand apartments have “the ultimate in flexibility, convenience and service in a premier location, gorgeous design, luxe finishes, spectacular amenities and innovative, make-your-life easier services inspired by the world’s best brands.” You might be interested to learn that Mill Creek Residential also owns the Walgreen’s site at 2190 Shattuck where their proposed 18-story building has stirred up considerable controversy because of blocking the view of the Bay from Campanile Way. In August 2018, Mill Creek proudly announced that the new Modera Acheson building will be full of amenities and have “dramatic City and Bay views.” There will be 205 residential units with 9 ft ceilings, wood plank floors, stainless steel appliances and in-home washers, dryers and storage space. The residential units will range in size from studios to 3 bedrooms in size, with the average size being 716 square feet. Some units will have private balconies and patios, and there will be 2 roof gardens with BBQs and fire pits. There will also be a clubhouse, a fitness studio, an “expansive business center” and 14,000 square feet of retail space. 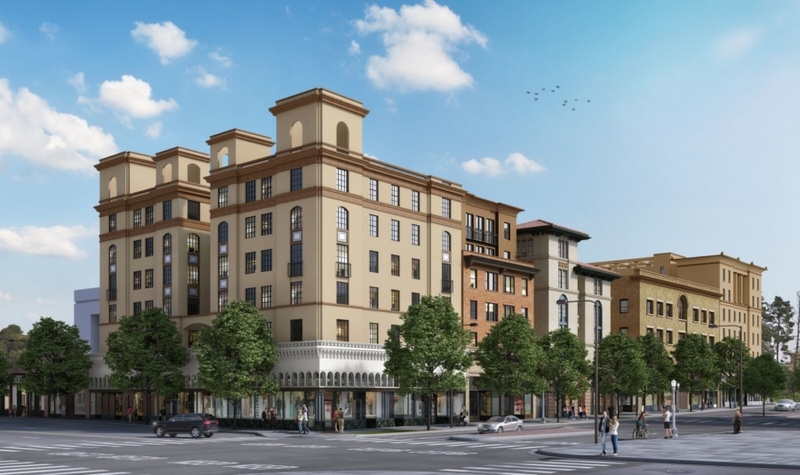 Eighty parking spaces will be available, 20 of which will be reserved for the retail and restaurant spaces that are proposed, and pets will be allowed. There are no affordable units in the building, as the owner opted to pay $4 million into the City’s Housing Trust Fund. Construction should be finished by 2020. BNC was delighted to learn of the most recent actions regarding the proposed project at 1900 Fourth Street (Spenger’s Parking Lot). However, before we get too carried away, the developer can still submit a standard application, so keep tuned.